The estimated average cost for Ashley Manor - Beverly Hills is roughly $5,463 per month. This is above the $5,400 estimated cost in Payette. While the US estimated cost is around $4,930, Idaho is around $4,923 each month. Situated within Payette, Idaho, Ashley Manor - Beverly Hills is a community for seniors. They provide senior care in a well-maintained and comfortable environment. The area this community is located in has a medium-density population, with about 9,881 residents in the 83661 zip code. It is a predominantly middle class area, with an average per-home income of $43,820. The residence is located close by various local conveniences, including health care services, shopping, and houses of worship. They're only 4.1 miles from St Alphonsus Medical Center - Ontario, Inc. There are 1 drugstores within one mile of the facility. Additionally, there are 3 churches within four miles, including Bible Baptist Church, Church of Jesus Christ of Lds, and Church of Jesus Christ of Lds. Ashley Manor - Beverly Hills offers the following types of care: assisted living, dementia care, and nursing home care. The facility is a great fit for individuals who require assistance with common tasks but who also desire to retain some degree of independence. 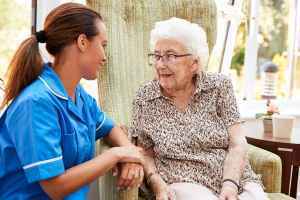 They can also accommodate individuals who are at any stage of dementia and who have trouble with common tasks, and who require close care on a frquent basis. In addition, they can house individuals who are mostly bed-ridden and who need to be cared for by medical professionals around the clock. This community has many amenities and services available to their clients. For example, they provide many different property features including high speed internet, an outdoor garden, an on-site beautician, a library, and outdoor walking paths. Additionally, they offer several room features that include housekeeping, in-suite washers and dryers available, and safety and handicap fixtures. Finally, they offer a few different enjoyable activities such as arts and crafts , general social activities, daily exercise routines, and educational programs.